The microbiome has received increasing attention over the last 15 years. Although gut microbes have been explored for several decades, investigations of the role of microorganisms that reside in the human gut has attracted much attention beyond classical infectious diseases. For example, numerous studies have reported changes in the gut microbiota during not only obesity, diabetes, and liver diseases but also cancer and even neurodegenerative diseases. The human gut microbiota is viewed as a potential source of novel therapeutics. Between 2013 and 2017, the number of publications focusing on the gut microbiota was, remarkably, 12 900, which represents four-fifths of the total number of publications over the last 40 years that investigated this topic. 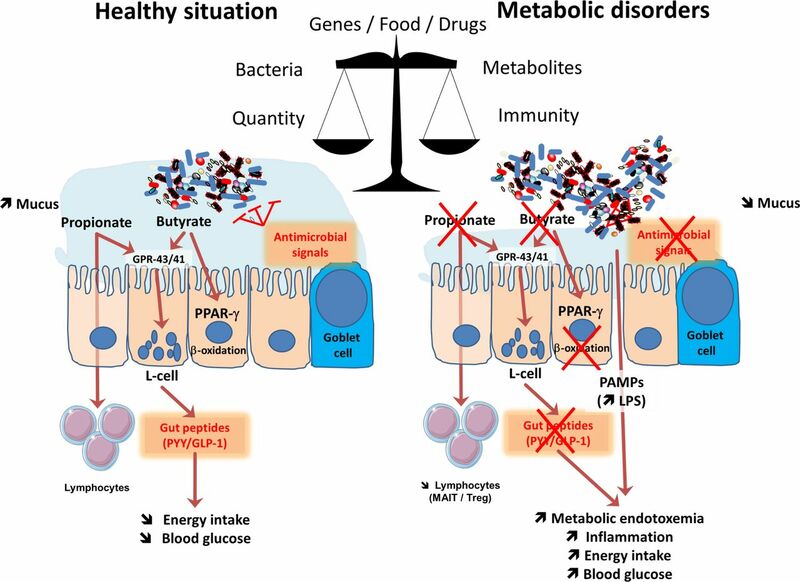 This review discusses recent evidence of the impact of the gut microbiota on metabolic disorders and focus on selected key mechanisms. This review also aims to provide a critical analysis of the current knowledge in this field, identify putative key issues or problems and discuss misinterpretations. The abundance of metagenomic data generated on comparing diseased and healthy subjects can lead to the erroneous claim that a bacterium is causally linked with the protection or the onset of a disease. In fact, environmental factors such as dietary habits, drug treatments, intestinal motility and stool frequency and consistency are all factors that influence the composition of the microbiota and should be considered. The cases of the bacteria Prevotella copri and Akkermansia muciniphila will be discussed as key examples. In the present perspective review, recent evidence showing the impact of specific bacteria and the involvement of the innate immune system will be discussed. However, most importantly, we debate one part of the current knowledge in this field and ask the following question: how should we interpret the numerous hopes, promises and threats? Before discussing specific examples, we recommend that you scrutinise the next paragraph, which introduces us to the infinite minuscule world that may have great impact on human health (figure 1). 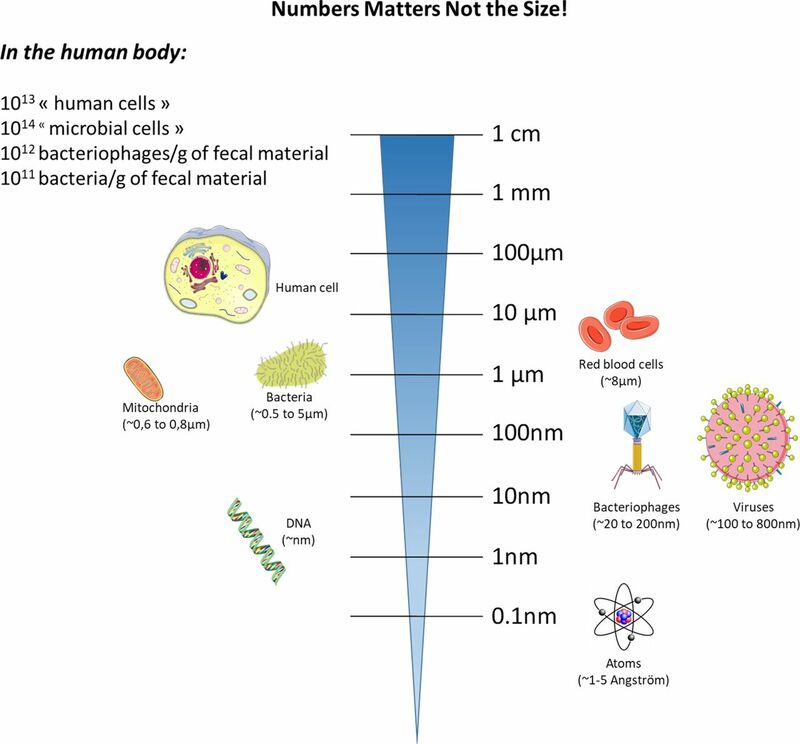 Relative sizes of major host cells and their components versus those of bacteria and viruses. The gut microbiota is now considered an important partner of human cells, interacting with virtually all human cells. In 2017, approximately 4000 papers focusing on the gut microbiota were published , and between the years 2013 and 2017, more than 12 900 publications were devoted to the study of the gut microbiota. This remarkable number represents more than 80% of the overall publications of the last 40 years (since 1977) on this topic. Therefore, this simple finding highlights the fact that this field of research is not only blossoming but also strongly suggests the necessity for advancement. Although not discussed in detail on this perspective review, we should briefly mention that in addition to bacteria, other key microorganisms, such as archeae, viruses, phages, yeast and fungi, are present in the gut. These microorganisms, which likely control the activity of the host and, most importantly, of the gut microbes, have been investigated in detail and may be as important as bacteria. Therefore, the archaea, the virome, the phageome and the mycobiome offer an additional dimension to the investigation of host–microorganism interactions. As an example, the phages do not only exceed the number of bacteria (eg, 10-fold more phages than bacteria) but they are also new actors playing roles in these complex interactions.13–17 As a simple example, it has been more than a 100 years since Félix d’Herelle formally identified phages15 (figure 1). However, reproducible protocols to analyse the faecal phageomes using metagenomics analysis have only recently emerged.18 Therefore, this implies that this area of research requires more time before major fundamental breakthroughs can be translated to general applications for the public. Nevertheless, today, due to the different kind of media (ie, mode of communication), medical information can be rapidly disseminated to the public. Hence, one of the major caveats remains the lack of perspective not only from society but also from some scientists and healthcare professionals, who may misinterpret data or are expecting a direct translation of such complex research from the bench to the clinic. Therefore, experts in this field must provide access to such knowledge with caution and without delusion. Different systems recognise and monitor the presence of microorganisms in the body. For example, in the gastrointestinal tract (GI), epithelial cells play a major role as guardians that translate key information to the immune cells located in the lamina propria. In fact, the recognition and the monitoring of microbes is mainly performed by the innate immune system with pattern recognition receptors (PRRs) such as toll-like receptors (TLRs) and NOD-like receptors (NLR).19 The TLRs are transmembrane receptors expressed on cell surfaces (ie, TLR-2, 4, 5) or in endolysosomal compartments (ie, TLR-3, 7, 8, 9 or 13), whereas NOD receptors are cytosolic proteins. Together, these receptors recognise pathogen-associated molecular patterns (PAMPs) from microorganisms (eg, lipopolysaccharides, peptidoglycans, lipoteichoic acid, flagellin and muramyldipeptide) or danger-associated molecular patterns from damaged tissues.19 Thus, the GI tract not only contains a vast majority of the microbes that reside in the human body but also harbours probably the larger pool of the immune cells that are present in the body.20 Notably, the immune system also has a predominant effect on the composition of the microbiota.21 Therefore, GI cells are continually exposed to a vast number of microbial antigens and metabolites. In spite of this close proximity, we live with microorganisms in perfect symbiosis (figure 2). Major mechanisms involved in the crosstalk between microbes and host: impact of metabolism. The balance between healthy and pathological situations (eg, metabolic disorders) is crucial. This is under the tight influence of several factors including the genes, food and drugs. This left part of the figure shows that in healthy situation, the composition of the gut microbiome is associated with a higher mucus layer thickness, the production of antimicrobial signals and different short-chain fatty acids such as butyrate and propionate. Both butyrate and propionate bind to G protein coupled receptors (GPR)-43 and GPR-41 expressed on the enteroendocrine L-cells thereby stimulating the secretion of gut peptides such as glucagon-like peptide-1 (GLP-1) and peptide YY (PYY). This effect contributes to reduce food intake and to improve glucose metabolism. Propionate can also bind to GPR-43 expressed on lymphocytes in order to maintain appropriate immune defence. Butyrate activates peroxisome proliferator-activated receptor-γ (PPAR-γ) leading to beta-oxidation and oxygen consumption, a phenomenon contributing to maintain anaerobic condition in the gut lumen. As depicted on the right part of the figure, during metabolic disorders, changes in the gut microbiome are linked with a lower mucus thickness, decreased antimicrobial defense and butyrate and propionate production. As a consequence, L-cells secrete less gut peptides. The lack of PPAR-γ activation lead to higher oxygen available for the microbiota at the proximity of the mucosa and increases the proliferation of Enterobacteriaceae. The decrease in propionate also contribute to the lower abundance of specific T cells (mucosal-associated invariant T cells (MAIT) and Treg) in the lamina propria of the gut. Altogether, such changes in the microbial environment and metabolites induce a leakage of pathogen associated molecular patterns (PAMPs) such as the lipopolysaccharide (LPS) that are increased in the blood, and trigger low-grade inflammation. In addition to the specific changes in the composition of the gut microbiota, it is now accepted that several key factors contribute to the translocation of bacterial compounds from the intestinal lumen to the body. As previously indicated, gut microbes are constantly interacting with intestinal epithelial cells; however, in normal conditions, the gut barrier function is highly efficient due to complex multifaceted mechanisms (ie, tight-junction proteins, thickness and composition of the mucus layer, presence of antimicrobial factors, intraepithelial lymphocytes and other adaptive immune cells and production of immunoglobulin A (IgA)) (figure 2) (reviewed in König et al and Wells et al 38 39). It is also well known that a loss of immune tolerance is associated with bowel inflammation. Interestingly, recent data have also shown the accumulation of T cells in the intestines of obese subjects consuming high-fat diets, an observation that correlates with morbidity.40 Conversely, the circulation of other immune cells, such as mucosal-associated invariant T cells (MAIT) (ie, innate-like T cells), which exhibit elevated Th1 and Th17 cytokine production is strongly decreased in patients with obesity and type 2 diabetes41 (figure 2). In conclusion, the gut barrier is controlled by fine-tuned communications occurring between gut microbes and the host immune system. Additionally, the complexity of those interactions raise the question about the level of our current understanding and eventually contribute to explain why it is relatively difficult to develop specific therapeutic targets. In addition to receptors recognising specific constituents of the cell membranes of microbes and directly related to the innate immune system, there is evidence that many different microbial metabolites also influence host metabolism mostly by binding to specific host membranes or nuclear receptors (for review see Husted et al, Pallister et al, Brown and Hazen, Rastelli et al, O’ Mahony et al, Kasselman et al 42–47). Among the numerous metabolites produced by the microbiota, we can mention important metabolites such as folate, indoles, secondary bile acids, trimethylamine-N-oxide (TMAO), but also neurotransmitters (eg, serotonin, gamma amino butyric acid), and eventually short-chain fatty acids (SCFAs). The latter example is likely the most studied. Indeed, the most investigated are probably the SCFAs (ie, butyrate, propionate and acetate). It has been shown that SCFAs are recognised by G-protein-coupled receptors such as GPR-41 and GPR-43.48 The stimulation of these receptors triggers the secretion of intestinal peptides involved in glucose metabolism or food intake, such as glucagon-like peptide-1 or peptide YY (PYY)49 50 (figure 2). Therefore, by stimulating enteroendocrine cells to produce key hormones, microbes act from a distance on different organs.51–53 Notably, propionate also regulates immune cells to produce antimicrobial factors and, therefore, may act as an immune regulator,54 including a reduction of cancer cell proliferation.55 56 This latter example also highlights the fact that a distinct microbial metabolite may play different roles, ranging from the regulation of glucose levels to immunomodulatory effects, in host metabolism. Along these lines, in reality, the role and mechanisms of action of some SCFAs might also be very different from what has previously been thought. For example, butyrate has been considered for decades to be an essential energy source, allowing colonic cells to proliferate and contributing to the maintenance of healthy gut barrier function. However, in a recent study, Byndloss et al discovered that butyrate may also strongly influence the microbial environment and ecology by communicating with host cells. It has been shown that butyrate instructs colonic cells to ‘breathe’ oxygen by activating β-oxidation in order to protect the host against the expansion of potentially pathogenic bacteria to the intestinal lumen (figure 2).57 58 Specifically, the authors used recent information suggesting that the extremely low quantity of oxygen present in the luminal content of the gut (ie, the anaerobic state) is a condition that is required to prevent the expansion of putative facultative anaerobic pathogens such as Salmonella or Escherichia.59 Thus, the authors demonstrated that the consumption of oxygen by the host cell to β-oxidise butyrate in the mitochondria contributes to limiting the diffusion of oxygen from the colonic cells into the luminal compartment, eventually leading to the maintenance of anaerobic conditions57 58 (figure 2). What matters: quality, quantity or activity of microbes? Over the last decade, pioneering papers have shown that some metabolic disorders, such as obesity and diabetes, are associated with shifts in the microbiota at the phylum level (ie, in the Firmicutes/Bacteroidetes ratio).60 Since this discovery, not all papers have been able to replicate this finding, which gives rise to the following question: should we focus only on the general composition at the phylum level or should we go deeper (ie, the genus and species levels)? However, in addition to these considerations, there is another important question: is it more relevant to explore the metabolic capacity of the intestinal microbiota and, eventually, to the metabolites produced (eg, butyrate, bile acids, TMAO) than it is to study the microbial composition alone?42 51 61 62 Indeed, as briefly described in the previous chapter of this perspective, there are numerous metabolites produced by the gut microbiome that can influence our metabolism. At this stage of our knowledge, there are no clear answers to these questions. Along these lines, in addition to these discoveries and observations, a recent, very elegant study demonstrated that it is the absolute quantity of microbes and not the proportions of microbes that really matters.63 This study strongly argues that most previous studies, which have primarily been based on the investigation of the relative proportions of microbes, have probably not been able to capture the essence of the problem. For example, the authors observed differences of up to 1 log between the microbial loads of healthy individuals. As another striking example, in this paper, the authors highlighted the fact that the abundance of Bacteroides is associated with Crohn’s disease only when using the classical relative abundance-based profiling, whereas by using quantitative microbiome profiling, it was the abundance of the genus Prevotella that was found to be decreased in patients with Crohn’s disease.63 Moreover, this observation underlines the real risk and the limitations of using relative abundance-based analysis because this type of analysis can lead to erroneous interpretations (figure 2). Similarly, the necessity for analysing not only the presence of certain gut microorganisms but also the activity of these organisms has already been discussed by authors.64 65 More recently, Schirmer et al profiled the gut microbiomes of more than a hundred individuals, including patients with Crohn’s disease, ulcerative colitis and non-IBD control patients and analysed both the metagenomes and the metatranscriptomes of these individuals.64 They discovered that most of the bacteria were well correlated when analysing DNA and RNA abundances; however, strikingly, some organisms that were abundant in terms of metagenomic data were, as stated by the researchers, ‘inactive or dormant’ in the gut with little or no expression. Conversely, some disease-specific bacterial characteristics were only detectable when analysed at the transcriptional level. Therefore, such findings highlight the fact that the transcription of specific gut microbial pathways may vary over time, leading to potential phenotypic changes that may be complementary to changes associated with classical metagenomic abundance (figure 2). Several interesting studies have also proposed that the microbiome should be seen as an integral part of precision medicine approach (for review see Suez and Elinav and Kashyap et al 67 68) because it contributes to interindividual variability in all aspects of diseases situation but is also a modifiable factor leading to the development of future therapeutics. For example, Zeevi et al elegantly illustrate this concept by showing that the gut microbiome can be used to predict personalised blood glucose responses to specific diets, which differ between individuals.69 However, this has required the use of machine-learning algorithm that integrates many parameters, such as in this case the week-long glucose levels, dietary habits, anthropometrics, physical activity and gut microbiota from more than 800 individuals and more than 45 000 meals. Interestingly, the algorithm was then tested in an independent cohort of 100 individuals.69 Although found as highly promising and clearly showing the application by some researchers, others have requested to tone down the potentiality of a broad applicability with conclusions such as the fact that predictive algorithms are black boxes with complex statistical associations without the real mechanisms explaining the presence of such associations.70 Or others mentioned that the results does not provide enough evidence that the model is finally superior to the current methods of detecting high glucose levels and even did not demonstrated that personalised nutrition advice are superior to standard advices in view of managing high glucose levels in postprandial situations. Actually, there is not yet a full consensus reached on what is the best option and how to proceed to design future personalised medicine, but the field is relatively young and warrants further work. Nevertheless, obtaining a more comprehensive analysis of the situation by screening not only the composition but also the metabolites (eg, metabolome) in prospective conditions (as opposed to the current conditions that have the caveat of only studying single time points) will likely be useful. Notably, one may also argue that most studies have examined faecal material (which is easily accessible), whereas the mucosal microbiota is still under investigated (figure 2). This without saying that such ambitious studies will require standardised protocols for sampling, storage and analysis. In addition, as it has been done for many years in the area of nutrition and drug treatments, we should probably develop large-scale longitudinal studies. Indeed, these kind of future studies should be designed to allow a follow-up of several years in a very broad cohort of subjects (ie, apparently healthy as well as diseases subjects) during which samples (eg, blood, urine, faecal) as well as many as possible information should be carefully followed on top of the classical dietary habits and drug use. Altogether, the different points discussed above strongly support the need for functional studies but it also highlight the current difficulties to obtain a clear consensus on the best way to proceed. Hence, to obtain a complete overview of the role of the microbiome on health, we will still need to combine compositional analysis of microbiomes and showing changes correlating to environmental changes (ie, diets, drugs) or biological states (ie, interindividual physiological variations, diseases). This will then require follow-up studies to validate the causality. This is the purpose of the next chapter of this perspective review. This last part of the review is dedicated to a discussion of critical issues and the necessity to develop well-defined experiments before claiming that some microbes are or not beneficial or even deleterious. As stated above, when a correlation is found between a given microbe and a disease or healthy situation, it is challenging to show the exact implication of the candidate on the onset of the disease or conversely its beneficial impact. In other words, as mentioned in the previous paragraphs, the literature often discuss the role of specific candidates (ie, bacteria) as potential beneficial or deleterious candidate following correlative works. However, sometimes we probably rapidly (too rapidly) infer positive or negative effects without properly investigating these effects. Therefore, we, as researchers usually start from correlation and seldom provide proof of concept by using isolated bacteria or identified metabolites. This is not because we do not want to investigate properly the roles of ‘new’ microbes or metabolites; but because it might be difficult to culture some bacteria. Indeed, moving from the signature identified at the 16S level to the proper isolation of the candidate bacteria and to investigations in complex models (even in vitro) usually requires much time and effort. Although recent advances in culturomics have been made,71 72 the isolation and the identification of anaerobic bacteria remain time consuming and fastidious.72 73 Moreover, when a putative candidate has been isolated and cultured, it is still necessary to culture it in quantities that are compatible with chronic in vivo testing. On top of that, at the level of our knowledge, it is still very difficult to fully decipher the role of any microorganism in a complex community such as the gut microbiota. This last point is illustrated by two specific examples: the cases of two bacteria that is Prevotella copri and Akkermansia muciniphila. The role of P. copri has been recently investigated in two independent elegant studies. Although, both seminal papers reached their respective conclusion from data obtained from human observational studies and subsequently confirmed in mouse intervention studies, they represent a clear example on how misleading a simple association study can be and how potential factors may influence discrepant and even contrasting results from functional proof-of-concept studies. Association between Akkermansia muciniphila and several diseases: what is known? What are the major confounding factors. The picture illustrated different pathological situations where the abundance of the bacteria A. muciniphila has been found to be increased or decreased. It also highlight several confounding factors associated with the modulation of the gut microbiota and eventually the abundance of A. muciniphila according to the health situation and shows the current data for which a proof-of-concept of the link between the disease and the presence of the bacteria has been made. With regard to immunity, the impact of A. muciniphila seems to be of great importance not only in the context of metabolic syndromes or for reducing autoimmune type 1 diabetes as described above105 107 but also in the context of cancer therapy. It has been previously shown that anticancer therapies may rely on the composition of the gut microbiota.110 However, in a series of recent studies,111–113 a role for A. muciniphila in this context has been discovered. Specifically, the authors have shown that the gut microbiota and even specific key bacterial species may influence the outcomes of anticancer immunotherapy, such as anti-PD-1 treatment.111–113 First, the authors simply observed that the patients responding to anti-PD-1 treatment were those exhibiting increased abundance of gut A. muciniphila compared with non-responders. This observation suggested that a favourable drug response might be observed in the presence of A. muciniphila. While this finding was a simple correlation, the authors clearly moved to a proof-of-concept strategy when they decided to transfer into mice the microbiota from responders and non-responders. In this experiment, the authors observed a similar response, that is, an altered drug response in the absence of A. muciniphila. Although they used particular models, that is germ free or antibiotic-treated mice colonised with the microbiota from responder or non-responder donors, the treatment with the bacterium A. muciniphila reversed the compromised efficacy of anti-PD-1 blockade in mice receiving the microbiota from non-responders. Therefore, poorly responding mice (ie, colonised with non-responders faecal material) turned into responders on treatment with A. muciniphila, clearly showing that the presence of this bacteria plays an important role. More importantly, the authors found that this result was the consequence of an immunomodulatory effect of A. muciniphila.111 Despite this very important finding, we may not rule out that the effects are not directly mediated by this bacterium but requires the activity (or cross-talk) with one or several other key species which drive the beneficial effects. Moreover, further human studies are needed in order to consider the bacteria as therapeutic adjuvants in this context. More specifically, recent papers have characterised the gut microbiome of patients with MS and have identified variations in specific microbes. Indeed, the levels of 25 different bacteria were significantly different between diseased patients and controls, and one of these bacteria was A. muciniphila.114 115 Strikingly, the studies by Berer et al and Cekanaviciute et al focused their attention on the increased abundance of A. muciniphila in the faecal material of patients with MS. However, although both studies elegantly demonstrated that the faecal microbiota of MS-affected individuals worsened disease progression compared with control individuals when transplanted into a mouse model of MS, none of these studies was able to detect the presence or any change in the abundance of A. muciniphila after the transplantation of the microbiota from the human donor into the recipient mice. Consequently, this observation exclude at this stage of the study the role of A. muciniphila in the onset of the disease. Thus, one may argue that we should take into account of such confounding factor for all the future studies, including neurodegenerative disorders. Therefore, these different examples strongly show us that we need a careful analysis and demonstration of causality before making claims about the risks or beneficial effects of some microbes. As stated above, the last decade has been characterised by an abundance of papers assessing the difference between the microbiomes of healthy or diseased cohorts. Hence, the misinterpretation of data and claims that a bacterium is involved in a phenotype based on changes in the abundance of the bacterium is still seen almost daily in the literature (figure 3). 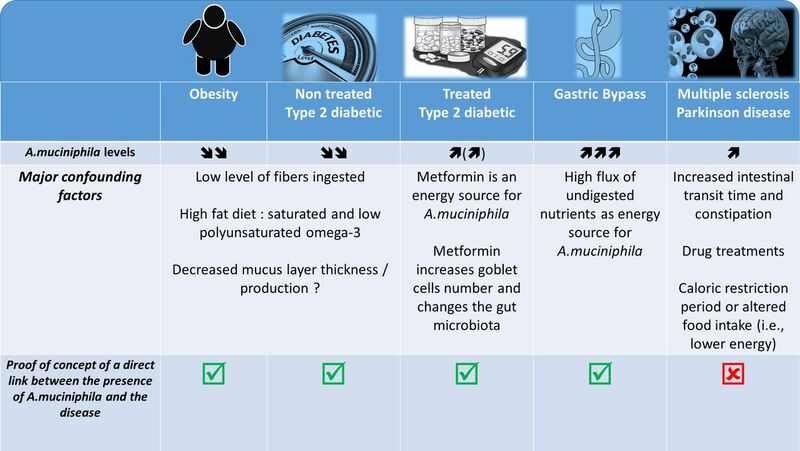 Finally, in addition to the case of P. copri and A. muciniphila, recent data combining both observational and proof-of-concept studies have also suggested that specific species might be directly involved in the protection against metabolic disorders associated with obesity (eg, Christensenella minuta)125 or, conversely, might contribute to the onset of such metabolic disorders (eg, Ralstonia pickettii, Enterobacter cloacae).126 127 Thus, these kinds of findings are interesting but cannot be generalised and warrant further confirmation using extensive studies, as detailed previously. We are living with a tremendous amount of microorganisms in our guts, ranging from bacteria, archaea to virus and fungi. There is no doubt about the fact that we have progressed in the analysis of the composition of the microbiota and of the key metabolites produced and even in the discovery and isolation of novel bacteria. However, we must acknowledge that a large number of the studies published the last couple of years have reported differences in the microbiome under different conditions. Although most of them are very well performed, we still need more work to go beyond the simple associations and we need to provide as much as possible more complex analysis (eg, multiomics and time series measurements) if we want to finally approach the final causality. Indeed, simple associations may lead to misinterpretation or overselling of expected results when translated into the human context. Thus, both types of approaches are important, that is, comparing diseased and healthy conditions and then showing the causality as a proof of concept. However, the general population as well as health practitioners should be rigorous when drawing conclusions from papers that assume that the discovery of differences in gut microbiota composition is potentially strongly associated with a specific disease or its overall evolution (box 1). Metagenome: This term refers to the entire genetic material present in a sample. The metagenome is composed of the genomes of several individual organisms, for instance, the genomes of human cells and of the gut microorganisms that are present in faecal material. Virome: This term refers to the entire viral genetic material present in a sample. The virome consists of the genomes of viruses. I profoundly acknowledge the tremendous work and effort of my research team and I am deeply grateful for their constant support. PDC is a senior research associate at FRS-FNRS (Fonds de la Recherche Scientifique).
. Gut symbiotic microbes imprint intestinal immune cells with the innate receptor SLAMF4 which contributes to gut immune protection against enteric pathogens. Gut 2017.
. The first microbial colonizers of the human gut: composition, activities, and health implications of the infant gut microbiota. Microbiol Mol Biol Rev 2017.
. Reduction in endotoxemia, oxidative and inflammatory stress, and insulin resistance after Roux-en-Y gastric bypass surgery in patients with morbid obesity and type 2 diabetes mellitus. Surgery 2011.
. Understanding the holobiont: how microbial metabolites affect human health and shape the immune system. Cell Metab 2017.
. Enteroendocrine functions and metabolism. Curr Opin Pharmacol 2013;13:935–40.
. Dynamics of metatranscription in the inflammatory bowel disease gut microbiome. Nat Microbiol 2018.
. Next-generation beneficial microbes: the case of Akkermansia muciniphila. Frontiers in microbiology 1765;2017:8.
. Recovery of ethanol-induced Akkermansia muciniphila depletion ameliorates alcoholic liver disease. Gut 2017.
. Gut microbiome differences between metformin- and liraglutide-treated T2DM subjects. Endocrinol Diab Metab 2017:e00009. Contributors PDC wrote the review. Funding PDC is a recipient of grants from FNRS, FRFS-WELBIO, under grant WELBIO-CR-2017-C02. This research was supported by the FRS-FNRS under The Excellence Of Science (EOS 30770923). This work is supported in part by the Funds Baillet Latour (Grant for Medical Research 2015). PDC is a recipient of the POC ERC grant 2016 (European Research Council, Microbes4U_713547) and ERC Starting Grant 2013 (Starting grant 336452-ENIGMO). Competing interests PDC is inventor on patent applications dealing with the use of A. muciniphila and its components in the treatment of obesity and related disorders. PDC is co-founder of A-Mansia biotech SA.